After suffering a low-grade fever for a couple of days, body aches, watery blood-shot eyes, I broke out in rashes on my face, neck and body today. The doctor thinks rubella is possible, and I related the story about how I never got the rubella vaccination at 12 or was it 16 at school as my mum kinda thought I had rubella before, or was it just measles? She couldn't really remember then and I opted out of that vaccination and now, decades later, I possibly got infected. The worst thing is my joints are impacted by the viral infection and they ache like mad. The side of the knees are swollen and even my toe joints ache. How crazy is that? I hope it sticks to its 3-day measles name and go off by tomorrow or at the latest, Saturday. And they say rubella normally doesn't affect anyone over 40! We cooked 2 nights in a row, and so we are breaking our home-cooking drought. Good start to the new year I must say. 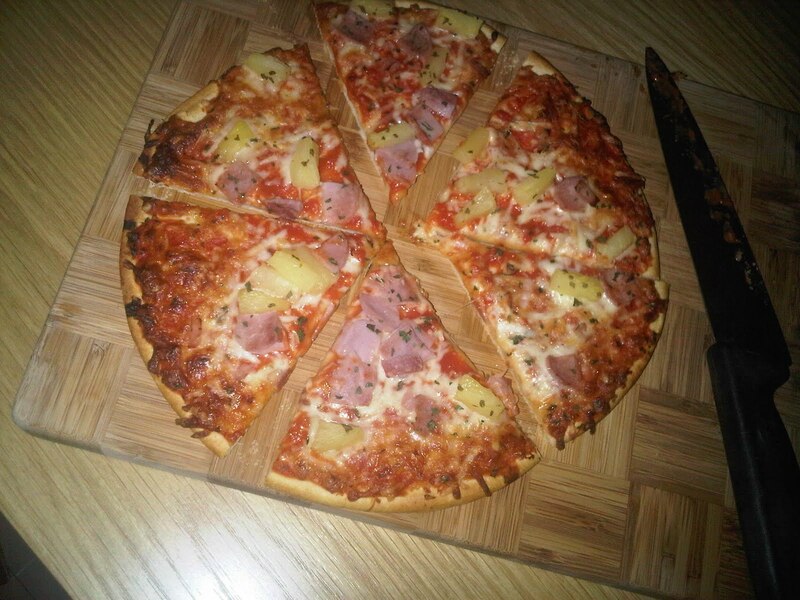 Tonight's dinner wasn't technically all home-cooked as we heated up a hawaiian pizza. 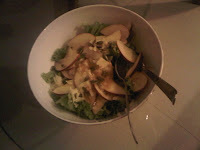 I did make the apple and lettuce salad topped with pumpkin seeds and crumbled cheese, with a dijon mustard and honey dressing. Hopefully this will set the rhythm for 2011 - more healthy eating, more home-cooking, and enjoying our new home more.